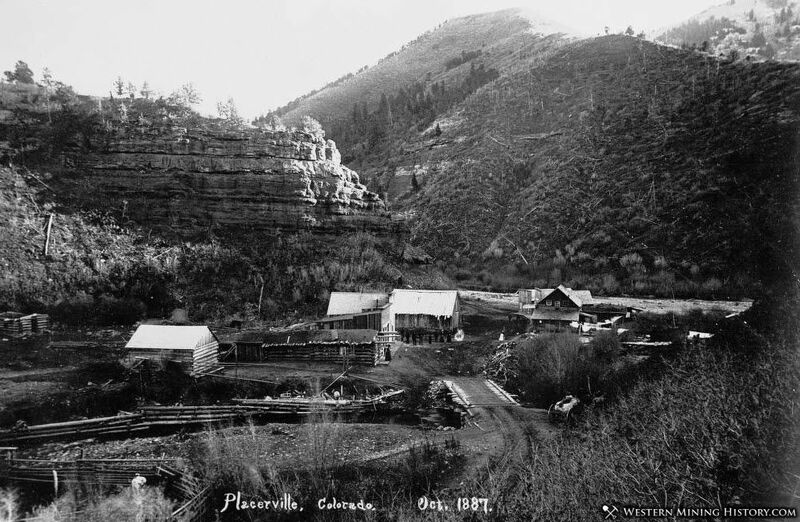 Placerville was originally established as a small mining camp, named after the placer gold mines located on the San Miguel River and Leopard Creek. The location became known as Old Placerville after the Rio Grande Southern Railroad constructed a depot and several passing sidings west of the original settlement, calling it Placerville. A. B. Frenzel discovered vanadium-bearing sandstone near Placerville in the late 1890s. The ore was in strataform bodies in the Entrada Sandstone (Jurassic) east of the town. The principal mineral was roscoelite, with minor montroseite and carnotite. By the fall of 1899, development was described as "of the most superficial character," although Frenzel had driven one tunnel 18 feet into the rock. By 1901-1902, Frenzel was excavating several thousand tons intended for shipment to Europe. Most of the Placerville ore was less than 3% vanadium, too low grade to pay for shipment to Europe, so in 1905 the Vanadium Alloys Co. built an ore-processing mill southeast of Placerville to recover the metal as ferro-vanadium, which it sold. At least five mines were active at one time, and by 1919 the two ore mills at Placerville were producing 30% of the world's vanadium. Through 1940, the mines produced about 3.7 million pounds of vanadium.